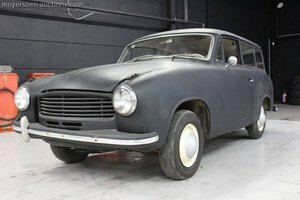 THIS A GENUINE COOL LOOKING ORIGINAL (1960) GERMAN 'GLAS ISAR' GOGGOMOBIL T700 ROYAL 2DR SALOON 4 SPEED MANUAL FINISHED IN FADED GREY (WAS A FACTORY BLUE CAR!) WITH BLUE INTERIOR! 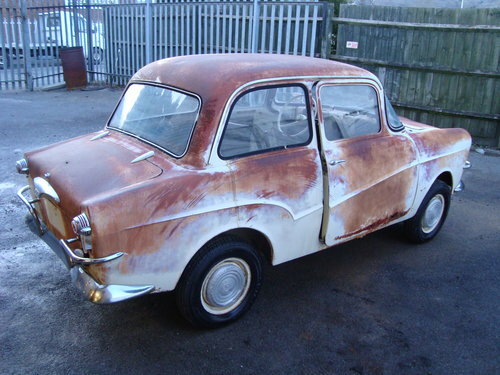 A GREAT 85% RUST FREE RESTORATION PROJECT OR FOR RARE SPARES/CONVERSION! 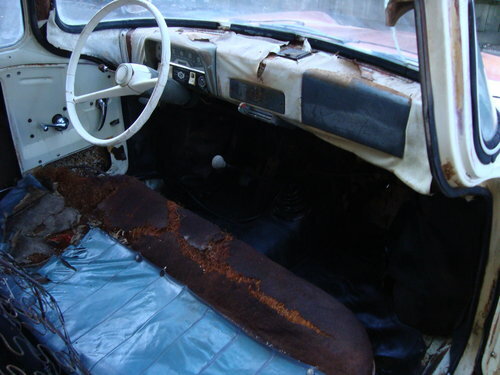 THIS CAR WAS PARKED IN THE NEVADA DESERT FOR 40 YEARS! JUST 2 OWNERS FROM NEW LAST ONE SINCE 1968! PLEASE SEE THE 50+ LARGE PICTURES IN THE SLIDESHOW BELOW TO SEE THE CAR IN DETAIL! 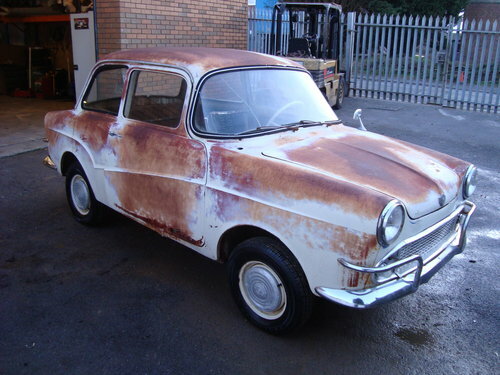 THE CAR IS PERFECT FOR RESTORATION AND IS COMPLETE APART FROM THE ENGINE, THE BODY IS 85% RUST FREE, UNDERNEATH THE FLOOR IS GOOD FEW SMALL RUST PATCHES BUT SOLID, THE CAR HAS A RUST PATCH TO THE REAR BOOT FLOOR WHERE THE BATTERY TRAY SAT TOO, ALL PANEL SHUTS ARE PERFECT! THEY ARE THE ORIGINAL PANELS FITTED, NO ACCIDENT DAMAGE, NO RUST TO ANY ARCHES/EDGES ETC. DOES HAVE RUST TO BOTH DOOR BOTTOM EDGES. 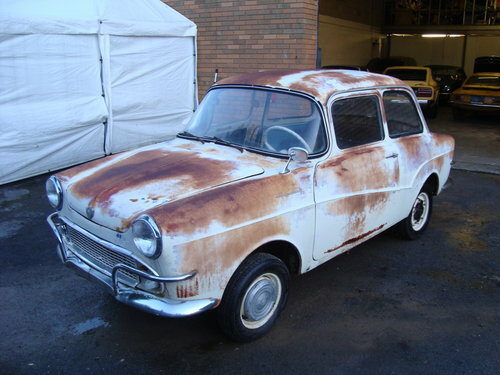 THE INTERIOR IS IN VERY POOR CONDITION AND REQUIRES WORK, BUTS ITS ALL THERE TO USE.. THE RUNNING GEAR IS IN SITU BUT THE ENGINE IS MISSING, REST IS IN UNTESTED CONDITION. WINDSCREEN IS CRACKED. THE OWNER SAID BACK IN THE 70'S HE WAS GOING TO FIT A SUBARU ENGINE IN IT! HIS DAUGHTER DROVE THE CAR TO SCHOOL EVERYDAY! 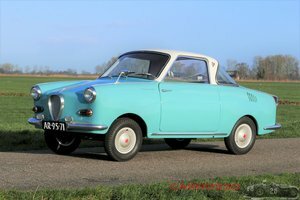 I CANNOT STRESS WHAT AN AMAZING CAR THIS WOULD BE FOR ANY GOGGOMOBIL FAN AND YOU WONT FIND MANY OF THESE FOR SALE ANYWHERE! THESE WILL ONLY INCREASE IN PRICE! ? WE HAVE THE CLEAN 1968 USA TITLE AND ALL NOVA PAPERWORK, THE CAR IS TAXES PAID AND READY TO REGISTER, COST IS £55 AND WOULD BE TAX AND MOT EXEMPT! SPEEDO SHOWING 18776 MILES TAKEN AS CORRECT! NO KEYS SUPPLIED UNFORTUNATELY. 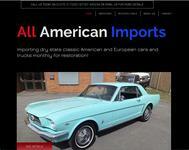 WE ARE IN THE BRISTOL AREA AND CAN ARRANGE SHIPPING TO ANY EUROPEAN COUNTRY! WE ALSO OFFER A SENSIBLY PRICED DELIVERY SERVICE TO ANYWHERE IN THE UK IF REQUIRED.